Broccoli is a member of the cabbage family, along with other vegetables such as cauliflower, bok choy and kale. It is rich in vitamins, minerals and phytochemicals -- which are thought to have cancer-fighting properties. Despite its potential benefits, some people avoid eating broccoli because it gives them intestinal gas, which can be embarrassing as well as uncomfortable or even painful. In most cases, however, gas can be prevented by taking some simple measures, allowing you to keep broccoli as part of an overall healthful diet. Intestinal gas is usually caused by either taking too much air into your digestive tract or by bacteria breaking down food in your intestine, which is the case with broccoli. This happens, primarily, because of the presence of a sugar in broccoli called raffinose. Human beings lack the enzyme to break down raffinose, which means it doesn't get broken down in the small intestine. Instead, raffinose gets passed down to the large intestine where bacteria attempt to break it down as much as possible. This process can produce a lot of gas, particularly if you aren't used to eating foods with raffinose in them. Other foods high in raffinose include beans, cabbage, brussels sprouts and asparagus. 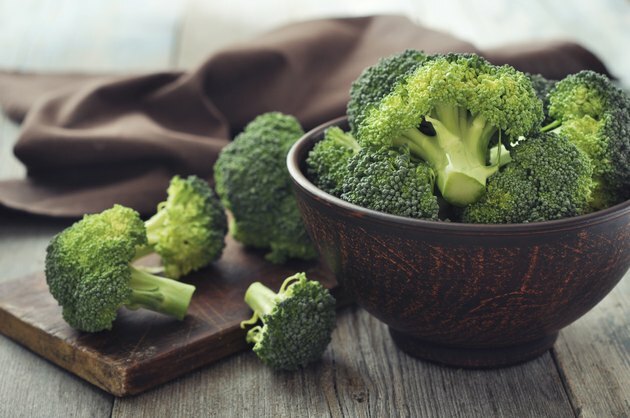 Supplements that contain the enzyme alpha-galactosidase can break down the raffinose in broccoli, which can potentially help prevent gas formation, according to the National Digestive Diseases Information Clearinghouse. The enzyme typically comes in liquid or tablet form and is taken right before eating to help break down the problematic sugar. It typically only takes one tablet to do the trick, or about five drops if it's in liquid form. A study published in "Digestive Diseases and Sciences" in January 2007 found that participants who ate beans, which contain high amounts of raffinose, and also took alpha-galactosidase experienced significantly reduced gas production when compared with subjects who took a placebo. If you find that taking an enzyme with alpha-galactosidase doesn't reduce gas when eating broccoli, it's possible that the high amount of fiber in broccoli is to blame, particularly if you aren't used to eating a lot of fiber or are consuming a lot of other foods high in fiber. The bacteria in your intestines eventually get used to the increased fiber, but it may help to consume a smaller portion of broccoli and then gradually increase the amount you consume until your system can adjust. Reducing your overall fiber intake may also help. Broccoli is best when eaten raw, as the cooking process destroys many of the vital nutrients. The nutrients it contains, particularly the cancer-fighting properties, can be very beneficial, so it can be worth the effort to continue eating it. If, however, taking preventive measures doesn't eliminate intestinal gas, stop consuming broccoli until you talk to your doctor about the problem. You might have an underlying digestive issue and eating broccoli is only making the symptoms worse.